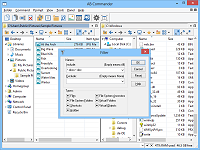 AB Commander™ is a dual-panel file manager and Windows Explorer replacement that you can use to work with two different folders at the same time, side by side, and perform operations with files and folders quickly and efficiently. In addition to the regular file management operations, it includes a built-in file splitter, folder synchronizer, image viewer with the slideshow capabilities, full-featured text editor and more. 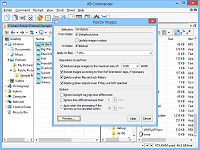 AB Commander offers a rich set of tools for navigating your computer and managing files. You can save time by using the quick access tools such as drive bar, history and favorites lists, customizable toolbars and keyboard shortcuts. You will also appreciate the power tools such as the built-in command line, commands to filter, compare, and synchronize the contents of folders, support for the regular, virtual, and compressed folders through the same unified interface, and more. 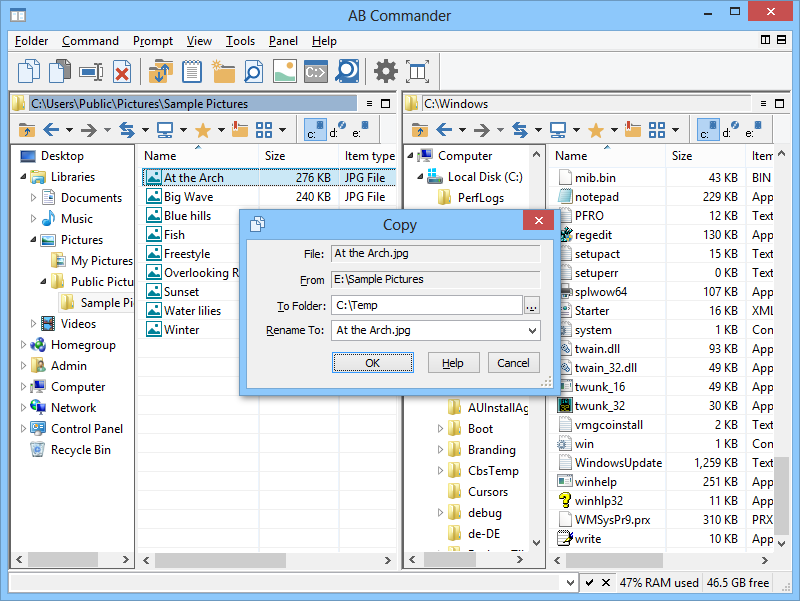 Once you start using AB Commander, you'll never want to use Windows Explorer again. What can you do with AB Commander? Work with two folders at the same time, side by side, copying or moving files between the folders quickly and efficiently, seeing the results of the file operations as they happen. You can use the menu, the toolbar, or just drag and drop the files with the mouse - whatever way you find most convenient. Rename many files at once, using file masks, or renumbering them sequentially, making your document collections neatly organized and manageable. Use filters to display only the types of files and folders you are looking for, hiding others. Of course, you can remove the filter at any moment, and return to viewing all files and folders together, as before. Search text files for the specific text you are looking for and navigate the search results with ease. 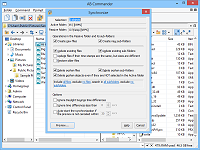 Edit text files right within AB Commander, no matter which file name extension they have, or even if they have no file name extension at all (such as the README files). 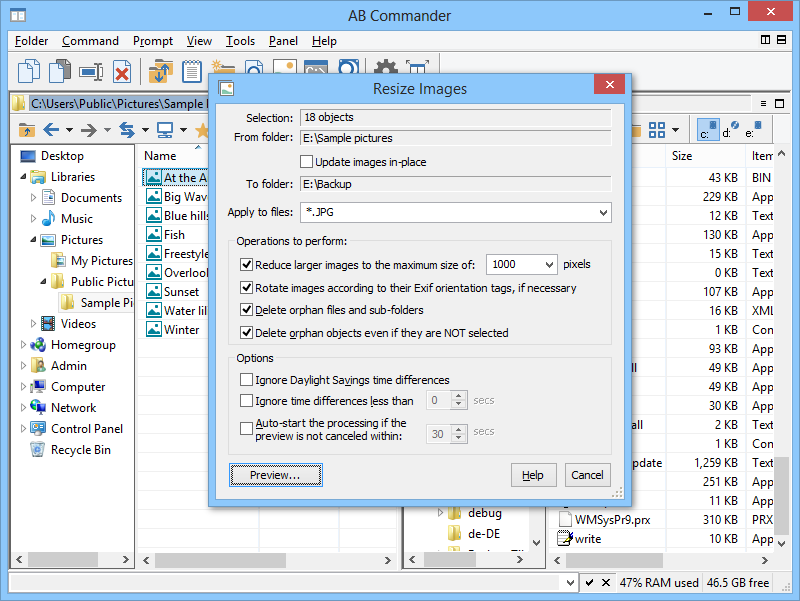 View image files right within AB Commander, rotate them, or see them full-screen, or as a slide show. Synchronize files between two folders by updating the newer files and skipping the copying of the files that did not change, thus significantly increasing the speed of the regular backups. Reduce resolution, rotate, or synchronize a large number of images in one step, to make them display on tablets and phones without taking up a lot of their storage. 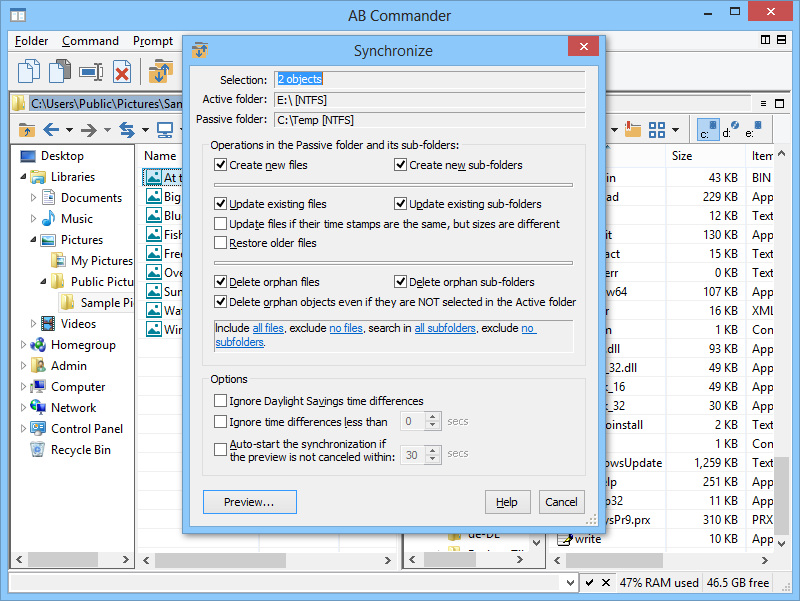 AB Commander puts you in control of your files and folders. You can use AB Commander to work with two folders at the same time, side by side, and perform operations with files and folders quickly and efficiently. 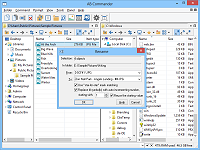 AB Commander is suitable for a wide range of file management tasks. 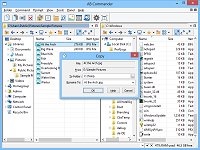 AB Commander works with drives of any format. If your computer can handle it, AB Commander can work with it. 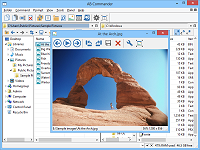 AB Commander can manage files and folders on both NTFS and FAT/FAT32 disks, including the network and removable drives. AB Commander runs on a wide range of Windows platforms. 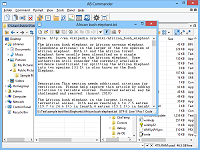 From Windows XP to Windows 7, 8, and 10, with all service packs and hotfixes, all are supported by at least one of the available editions of AB Commander. AB Commander is easy to use. AB Commander sports one of the most intuitive user interfaces, that makes it easy to use by both novice users and computer professionals. AB Commander "speaks" plain English. Attention System Administrators: AB Commander is enterprise-ready! The AB Commander Administrator's Kit is available now. You don't have to be a computer professional to understand how to use AB Commander. AB Commander User's Guide describes its commands and operation in plain English, without "pseudo-techno" or "geeky" talk. (And it does not baby-sit you either). AB Commander is widely used. Many thousands of copies of AB Commander have been downloaded by computer users from virtually all countries of the world. It lets you perform many operations in more than one way, letting you choose the most convenient method for you. You can customize the look and feel of AB Commander to suit your personal style and preferences. 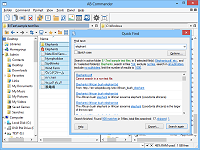 AB Commander can be used with other disk and shell tools. 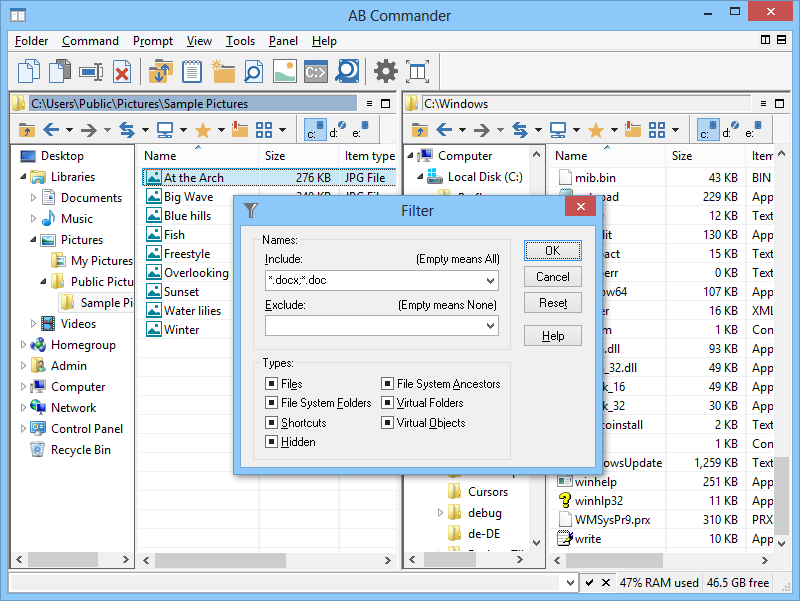 AB Commander fully supports the third-party shell extensions that enhance the operation of Windows Explorer. For the corporate customers we offer a separate build of AB Commander that does not require license validation over the Internet. 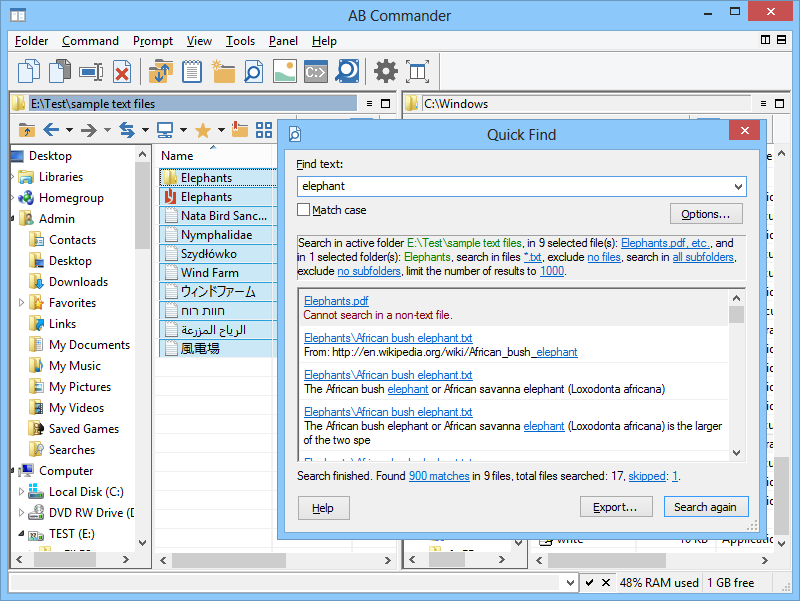 The AB Commander Administrator's Kit contains the installation files in both the EXE and MSI formats, allowing the system administrators to quickly deploy AB Commander to a large number of computers. The Kit also contains a Group Policy template that you can use to automatically deliver the license key to a large number of the client computers. It can also be used to restrict many commands of AB Commander. AB Commander is actively maintained. 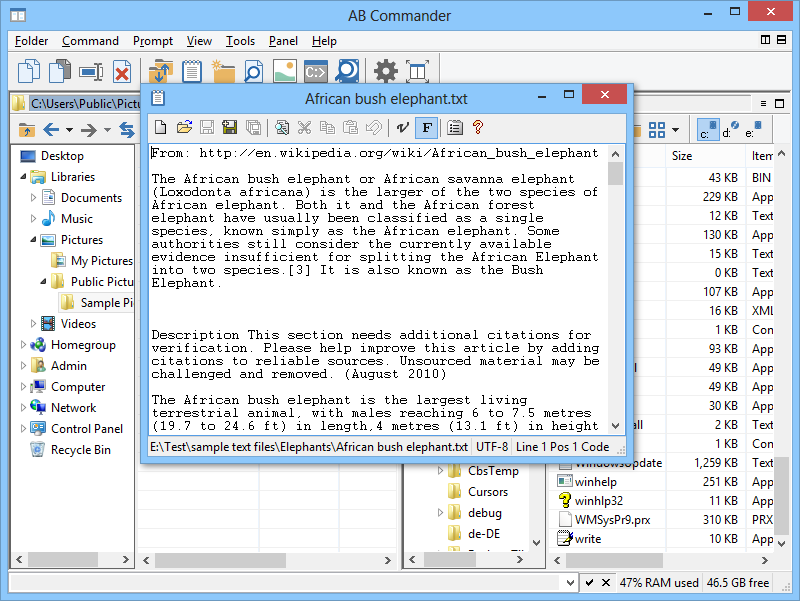 Since its first release back in 1998, we've been continuously extending, enhancing, and improving AB Commander. Now in version 19.1, AB Commander gives you more power than ever. "It's just a very good file-management tool that puts Explorer to shame." 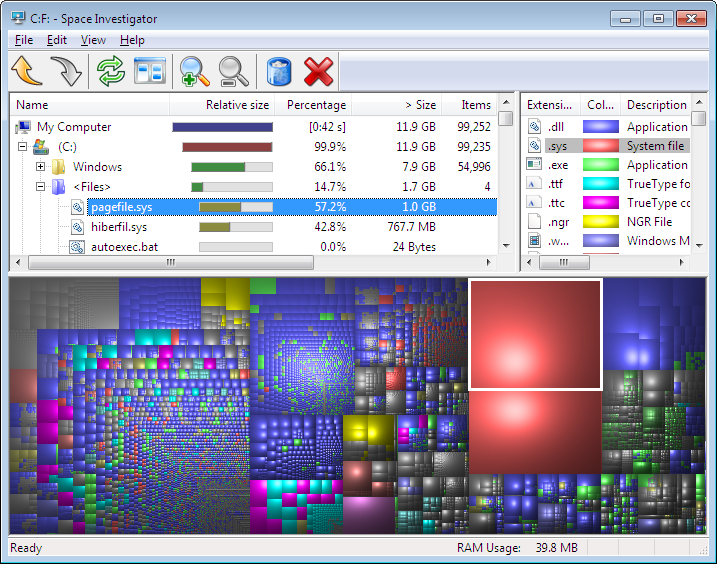 Space Investigator makes it easy to see how the hard drive space of your computer is allocated between different files and folders. You can use this information to find out which files and folders consume most space and delete the ones you no longer need. Buy AB Commander today and download Space Investigator for free!